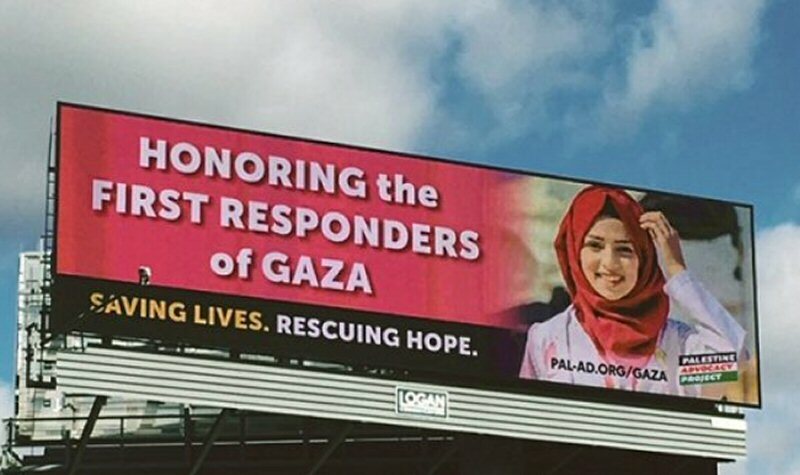 (PNN) Palestine Advocacy Project is launching a billboard ad campaign to honor the heroism and self-sacrifice of the Palestinian medics who put their lives on the line to rescue and treat injured protesters in Gaza’s ongoing “Great March of Return” demonstrations. The ongoing Great March of Return campaign began on March 30, 2018. Its aim is to end the ongoing siege and blockade of Gaza and resulting inhumane conditions under which its residents are forced to live, and to restore Gazans’ right to return to the homes they or their forebears were forced to flee in 1948. Although the vast majority of protesters are unarmed, the Israeli Defense Forces continue to fire indiscriminately on peaceable civilians in the besieged coastal enclave. As of October 1, 2018, Israeli forces have killed at least 190 Palestinians and wounded more than 21,000, according to health officials in Gaza. The victims include children, the elderly, and the disabled, as well as journalists and medics like Razan. Richard Colbath-Hess, founder of the Palestine Advocacy Project, explains that “the purpose of the billboard is to raise awareness about the courage and fortitude of Razan and other aid workers who risk their lives to support Gazans suffering under the disastrous effects of the U.S.-backed blockade.” Colbath-Hess notes that the United States government has enabled Israel’s blockade and military assaults by providing over $3.8 billion annually in military aid. Gazans live in some of the worst humanitarian conditions in the world, with the majority of the region’s children suffering malnutrition and nearly half of all adults without reliable access to food. Gaza’s residents survive on a 97% contaminated water supply and receive only four hours of electricity per day. The United Nations has warned that the area could become “uninhabitable” by 2020 as a result of Israel’s blockade and the destruction of civilian infrastructure. Gaza is often referred to as the world’s largest open-air prison.